Education without the transfer of knowledge, skills and capabilities is simply sharing information. For us, this continues rather than breaks cycles. 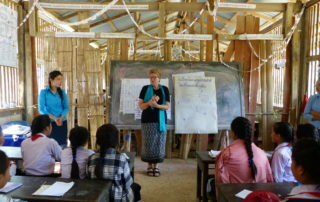 To truly build sustainable change in a country like Laos, teachers need the tools and training to educate their students and to grow awareness. 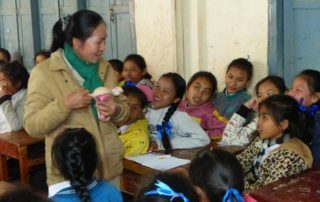 Communities need collaboration to transfer this knowledge through rural workshops and the support of local educators, exploring ways that they can become self-sufficient in managing their own and the community’s welfare. This transference of knowledge is critical. It allows the community to own their future. To break the cycle and to understand the opportunities available to them. Since 2015, we have provided 2-day training in Hygiene and Menstrual Hygiene Management (MHM) to 103 secondary school teachers, educators, nurses, doctors, and education officers. 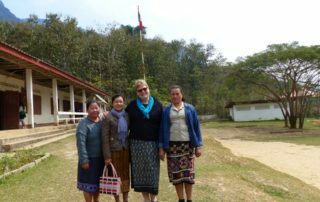 In addition, we have trained the Lao Red Cross who will reach 5000 girls in 3 years. We have also distributed more than 10,000 books and hygiene bags to rural school girls who participated in puberty workshops given by their trained teachers. Each year we evaluate our teachers to ensure that they are teaching the correct material, supporting their community and we deliver to them new and innovative development tools and materials. To help us to continue this important work, we need your help.